Simple and affordable, the DXR-5 2.4GHz Digital Video Baby Monitor with Night Vision from Infant Optics comes packed with features so you can watch over your baby privately, securely and with zero interference. A large 2.4" TFT screen (320 x 240 resolution) with a super sensitive built-in microphone captures each and every precious moment. The system boasts 2.4GHz static-free (digital) wireless transmission covering distances of up to 800ft in open areas and 150ft in enclosed areas. 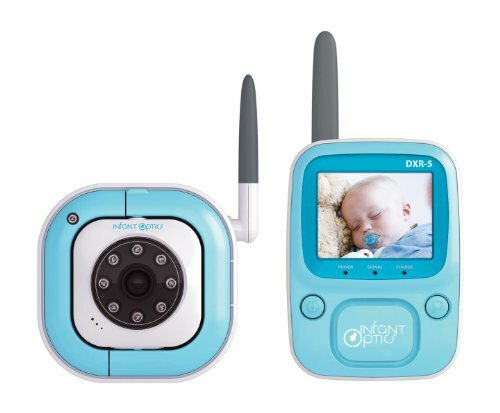 The wireless baby monitor also eliminates interference from other wireless household devices like cordless phones, video game controllers and wireless routers. FHSS (Automatic Frequency Hopping System) jumps between different channels in the 2.4GHz range, virtually 'encrypting' the data, ensuring others will not be intercepting your precious video and audio feed. Night vision means you can keep an eye on your baby even when sleeping up to 10ft away from the camera. When lights go down, the automatic IR vision turns on and the system adjusts to the level of light. Power-saving features include automatic voice activation power-saving mode, shutting the unit down automatically if no noise is sensed for 3 minutes and a built-in audio shutoff module, designed to eliminate any white noise or static when the sound level is below a predetermined level for 10 seconds. The DXR-5 comes with a handy camera stand and can be wall mounted as well, so you can easily view your baby in its crib as well as see all other parts of the nursery. Includes screws.